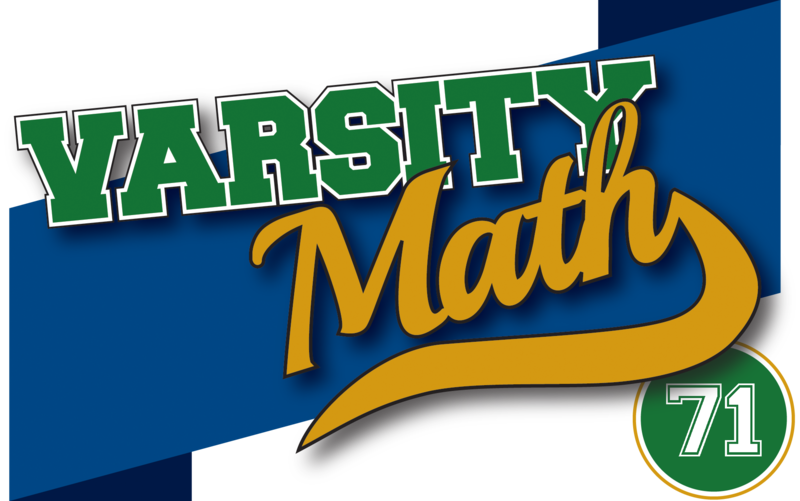 This week, the Varsity Math team is helping some friends in the graphic design department with their diagrams. Sam wants to draw a circle and an ellipse so that the circle has a radius of one, passes through both foci of the ellipse, and is internally tangent to the ellipse in two different points. Jules needs to fit a classic diagram illustrating the Pythagorean theorem onto a square poster. The diagram is a 3-4-5 right triangle with a square erected on the exterior of each side of the triangle. The basic unit for the diagram is supposed to be five centimeters, so the hypotenuse will be 25 cm long, the small square will be 15 cm by 15 cm, and so on. Jules wants to use the smallest square for the poster possible, but isn’t sure how to lay out the diagram to accomplish that goal. One team member says, “To make the smallest square, you just need to figure out how to rotate the diagram so that the larger of the height and width of the diagram has the smallest possible value.” “And that can only happen in an orientation in which at least two points of the diagram exactly touch one edge of the square,” advises another team member. What is the smallest side length Jules can use for the square poster and fit in the entire Pythagorean diagram? In The Groove. The record spins 100/3 rotations per minute for 45/2 minutes, and so it makes 100/3 × 45/2 = 750 rotations in all before it has to be flipped. The needle travels 15 cm – 6 cm = 9 cm radially during that time, so on each rotation it travels 9 cm / 750 = 0.012 cm (or 120 microns) from one turn of the spiral to the next. On The Path. To get an approximate solution, we reason that the circumference of each turn of the path is very nearly a constant multiple (2π) of its radius (since it is almost exactly a circle, off just a tiny bit at each end of the turn). The radius of each turn is varying linearly between 4 cm and 6 cm during the entire track. So the average radius of the turns on the track is 5 cm, and hence the average circumference of each turn is 5 × 2π cm, or approximately 31.4 cm. On the other hand, we know that the head travels 120 cm per second for 45 × 60 = 2,700 seconds, or 324,000 cm in all. (That’s three and a quarter kilometers, or almost exactly two miles!) Therefore, there must be approximately 324,000 / 31.4, or roughly 10,300, turns of the path packed into those 2 cm of radial distance. Hence the separation between turns must be roughly 2 cm / 10,300, or approximately 0.000194 cm, which is 1.94 microns, less than 1/60 of the separation of the grooves on an LP record.